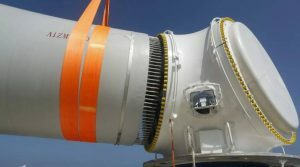 China Communications Construction Company (CCCC) has installed the first out of the 36 5.5MW wind turbines on the 198MW Guangdong Yudean Zhanjiang Wailuo offshore wind farm. 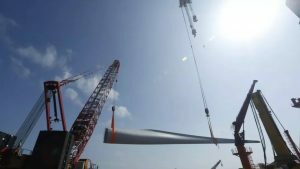 CCCC installed the first Mingyang Wind Power MySE5.5/7.0MW unit at the site offshore Guangdong Province, China, in six days, the company said. The project is being developed by Guangdong Yuedian Qujie Wind Power, a subsidiary of Guangdong Yudean Group. The project’s main EPC contractor is Guangdong Electric Power Design & Research Institute. 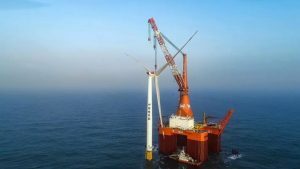 The Jiangsu Longyuan Zhenhua Marine Engineering joint venture is in charge of the engineering, procurement and construction of the offshore wind farm’s monopile foundations and the 220kV offshore substation. 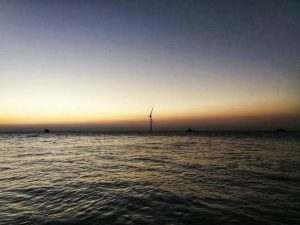 Guangdong Yudean Zhanjiang Wailuo is China’s first offshore wind project to be built with the general EPC contracting method and the first one in Guangdong Province to use large-diameter monopile foundations. It is also the province’s first offshore wind farm to use wind turbines with a rated capacity above 5MW.